Going Over $300K No contestant has gotten to the $300,000 mark as quick as Austin Rogers. In his first six matches, he twice surpassed $65,000 in one-day winnings ($65,600 and $69,000). Those totals were good enough for the top five of all time single-day winnings. After his eighth consecutive match, Rogers has now accumulated $306,900 and finds himself among Jeopardy legends. 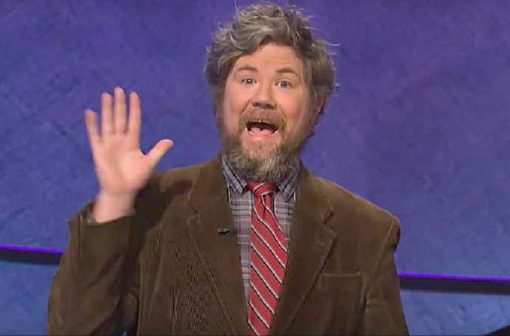 Surpassing Arthur Chu, Rogers now joins Ken Jennings, Dave Madden, Julia Collins, and Matt Jackson as the five players with the most overall winnings in the history of the game! So, is Austin Rogers Gay? As they always do after the first commercial break, Alex Trebek briefly chats with each of the contestants to learn a little bit more about them. 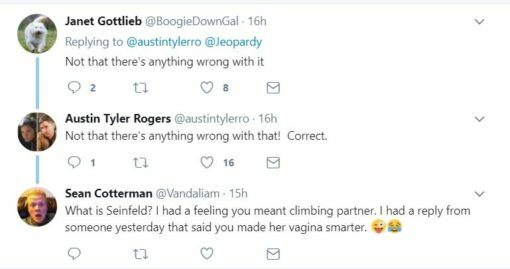 When it came to Rogers, he told a story about mountain climbing and being trapped by a small avalanche of snow (the word for it, I can’t quite remember, but it would make for a good Jeopardy answer). Rogers couldn’t move with all the snow piled on him. When his “partner” came over to him, he laughed at him for about ten minutes before digging him out. We’d love to have that lovable and playful goofball on our team. Either way, we’d all love to get drunk with Austin Rogers.